A new tool from No Kid Hungry allows summer meals advocates, program sponsors, and state agencies to easily and quickly access historical usage data from No Kid Hungry’s summer meals texting hotline (text “FOOD” or “COMIDA” to 877-877). 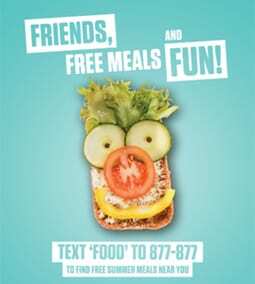 As summer meals partners plan for 2019, data gleaned from the texting hotline can yield insights about when and where families seek information about sites, whether sites were in operation when families texted, and general usage trends over time. A webinar recording is available to guide users on how to use the No Kid Hungry Summer Meals Texting Dashboard tool. What a great resource for our kids! I don’t think we realize how many kids in Oklahoma go hungry.